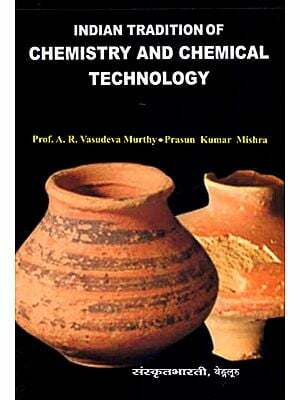 This book, “Vedic Science and Technology”, contains, in its ten chapters, the significant aspects of science and scientific thoughts of the Vedic bards reflected in their hymns and the modern scientific theories developed later. The Vedic deities symbolize the natural phenomena which the human beings of that period came across in their day-to-day life and had interactions with such events. Ostensibly, the modern scientific theories and practices have their roots in the most ancient tradition and culture. 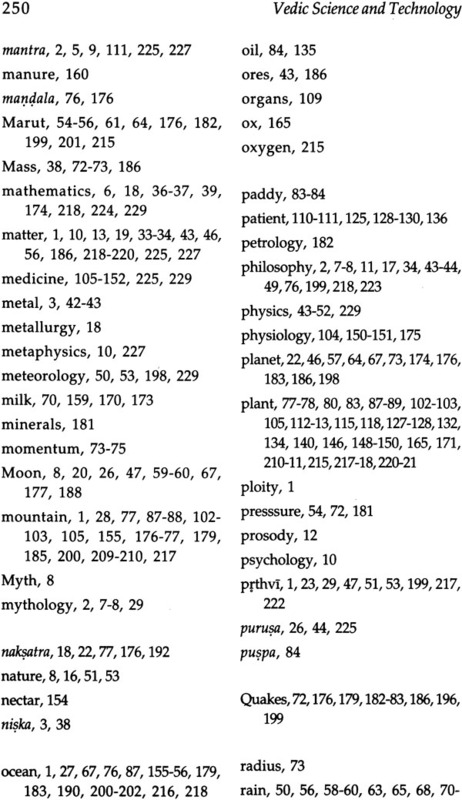 Various branches of knowledge such as Astronomy, Astrology, Cosmology, Cosmogony, Space-time Continuum, Mathematics, Chemistry, Physics, Meteorology, Seismology, Botany, Zoology. Medicine, Agriculture, Geology, Environmental Science and Ecology, and Science and Technology have been discussed here in accordance with speculations of the Vedic bards gleaned from the hymns. Earlier scholars belonging to other disciplines, especially from Linguistics, Mathematics, Physics and Astronomy have tried their best to interpret the Vedas from the point of view of their particular disciplines. 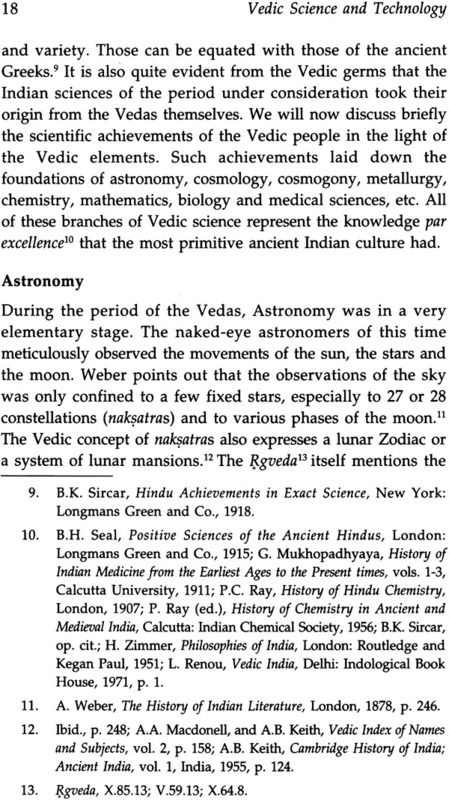 But, here, in this study, attempts have been made to analyse the Vedic verses in scientific terms adhering to various branches of modern science. The present discourse, no doubt, forms a strong base for any microscopic investigations of the Vedic thought and notion to be taken up in future by our inspired scholars and scientists. Dr Sadasiva Biswal a retired principal, born 1945 in Orissa, got his PhD degree from Utkal University, Bhubaneswar. He worked as the Reader and Head of the Department of Physics of several colleges in Orissa and has produced five PhDs. He has published thirty-five research papers .and more than two hundred articles on science besides fourteen books in Physics. Dr Biswal is associated with many scientific and research organisations in India and abroad, and is in the Research Board of Advisers of the American Biographical Institute Inc., Raleigh, North Carolina, USA. Dr (Mrs) Bidyut Lata Ray born 1947 in Orissa, obtained her PhD degree in Sanskrit from Utkal University, Bhubaneswar. She worked as the Reader and Head of the Department of Sanskrit of several colleges in Orissa. She has published twelve books on various aspects of Jagannatha Cult, Vedic and Puranic studies and more than one hundred research papers. Dr Ray is associated with many research organisations in India and abroad and is in the Research Board of Advisers of the American Biographical Institute Inc., Raleigh, North Carolina, USA. The word “Science” has its derivation in the Latin word Scientia, meaning “to know.” Knowledge obtained through science should not be solely factual but should advance understanding of phenomena. Obviously, any knowledge is not called science now-a-days. Science means today what is called systematized and formulated knowledge. It has been classified according to certain principles. In order to understand these principles we have to remember that our universe consists of matter, energy and life. These are all collectively called the nature. So, natural philosophy or natural science concerns all the phenomena in nature, the phenomena being partly physical and partly biological. Rabi proposes that science be taught “with a certain historical understanding, with a certain philosophical understanding, with a social understanding and a human understanding.” The study of the history of philosophy, on the other hand, shows that materialism is the earliest philosophy. Therefore, it is said that science begins from philosophy and finally it ends in philosophy. An enquiry into the origin and nature of ancient Indian materialism shows that the materialism has been blended with the philosophical thoughts. Oriental idealism is commonly contrasted with occidental materialism as if there were races of men either naturally materialistic or naturally idealistic. In fact, a survey of Indian philosophical system clearly points out that materialism was never unknown to our thinkers and “it undoubtedly had its day in India. Indian philosophy has had an extremely long and complex development much more complex and probably a longer history of continuous development than any other philosophical tradition. Thus, here we find varieties of thoughts scepticism, materialism, pluralism, dualism, naturalism, along with idealism of different forms. Philosophy being man’s quest after the ultimate reality, every philosophical tradition, including that of India, is characterized by so many divergent viewpoints. After surveying the history of materialism, Lange4 declares that not only materialism is as old as philosophy, but the latter itself started its career as the former. Thus, it would be correct to say that materialism is the oldest known philosophy. Russell goes a step further and identifies this earliest philosophy with science. Man has an inquiring mind. The earliest history of man reveals his attempts to understand his environment — attempts made not just to satisfy his curiosity but also to assure his survival in a sometimes hostile world. Like the primitive man, the modern man still feels the need to understand the world around him, and the cause-and-effect relationships which will enable him to predict events and, to a certain degree, control his environment. 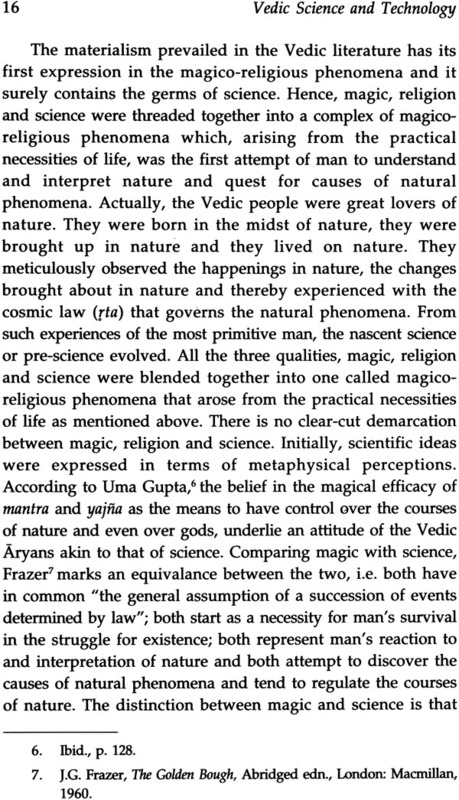 Formerly, Vedic people, in the absence of acceptable explanations of phenomena, developed their own informal science” based on magico-religious speculations which subsequently gave birth to true scientific observations in the theoretical and experimental perspectives. Our three Rgvedic suktas, viz. 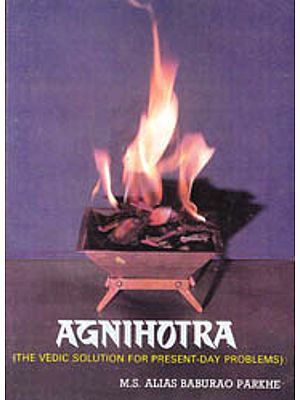 Prthvi, Agni and Savitr correspond to Matter, Energy and Life needed for the genesis and growth of any culture. Vedic literature records the thoughts of the most ancient Indian tradition and culture. 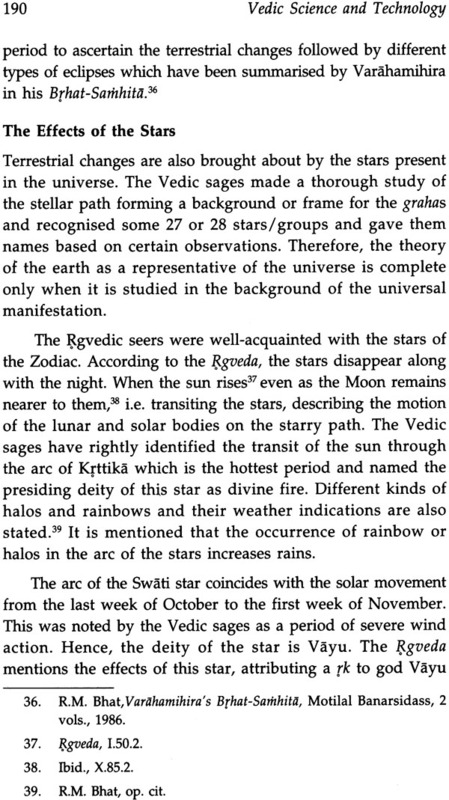 The magico-religious phenomena described in the Vedic literature gave rise to the growth of ancient Indian science. The primitive man was a hardboiled realist and a tough- minded materialist. Hence his belief in and practices of magic are the expressions of the most primitive materialistic thoughts which can properly be called the archaic materialism. Ostensibly, this archaic materialism, finding its first expression in the magico-religious phenomena, is bound to contain the germs of science. It, therefore, may justifiably be called the nascent science or pre-science. 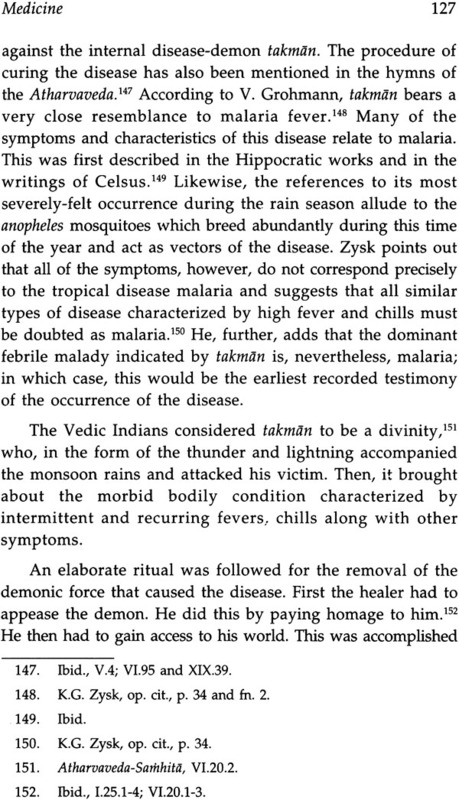 The Vedic conception of rta, implying some consciousness of the law-bound universe and the belief in the magical efficacy of mantra and yajna as the means to have control over the courses of nature and even over gods, underlie an attitude of the Vedic Aryans akin to that of science. Frazer, in fact, describes magic as the “next kin to science” because both have in common “the general assumption of a succession of events determined by law.” Both start as a necessity for man’s survival in the struggle for existence. 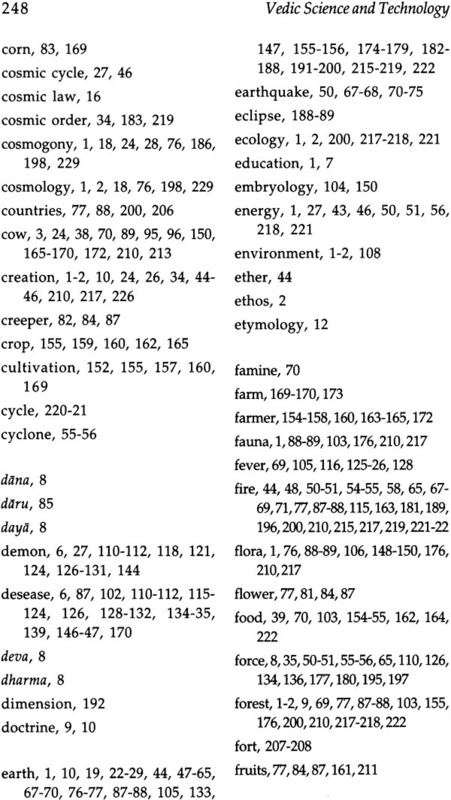 Both represent man’s reaction to and interpretation of nature and both aim at discovering causes of natural events and controlling them by human will. The distinction between them lies in the fact that magic has no theoretical background other than analogy or symbolism. Being the product of an immature phase in the evolution of human reason, it fails to discover the real causal connection among natural events; in other words, it fails to distinguish between causes — imaginary and real. Science, on the other hand, has been able to do so only through a process of unfolding of the reasoning faculty of man along with the accumulation of the a posteriori facts of experience in the course of a long period of history. Again, man, in the primitive stage, was too close to his immediate environment to have a detached view and wide comprehension of nature. Hence, in his interpretation of nature, though he starts with the rational laws of causality and uniformity of nature, he commits the fallacies of mal-observation and non-observation. Thus, his investigation of the natural phenomena consists of an illusory technique instead of the real one. Such illusory technique of magic is a necessary stage for the development of the real technique of science. 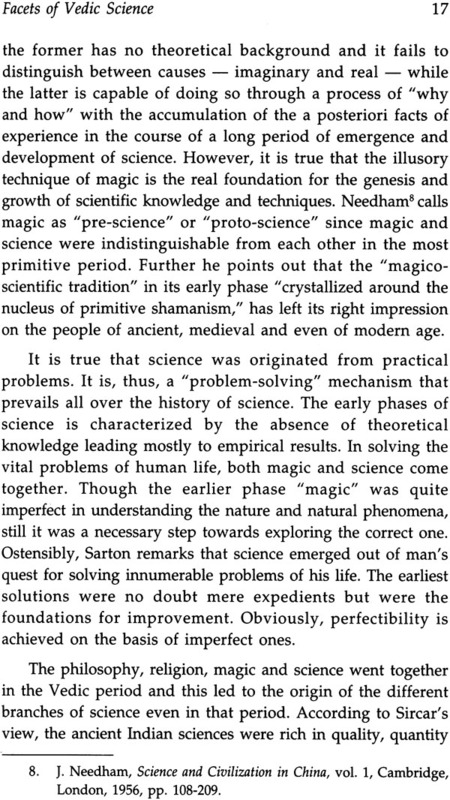 Needham points out that in its earliest phase, science was indistinguishable from magic; hence, he calls the latter “pre-science” or “proto-science.” According to him, this significant phase of the “magico- scientific” tradition, which in its beginning “crystallized around the nucleus of primitive shamanism,” has left its unmistakable imprint on he people not only in ancient and mediaeval periods but even rter the birth of modern science. The present treatise consisting of 10 chapters throws light on the ancient knowledge of the Vedic people vis-à-vis modern scientific theories. Earlier, people belonging to other disciplines, especially from linguistics, mathematics, physics and astronomy have tried to interpret the Vedas from the point of view of their particular discipline. Here, in this study, attempts have been made to analyse the Vedic verses in scientific terms. In the Rgveda, man did not postulate a scientific theory but it is equally clear that he was aware and self: conscious of the principles on which scientific theories are d. and moreover he was accurately perceiving the phenomenon of life and nature. In the Vedic literature, we come across innumerable myths to transmit the truths to the masses in an interesting and easily rrnzab1e manner, and to explain what was not yet really and fully understood. In all cultures, myths and legends were also created to engrave in the collective memory the traditions and history of a people, of a clan or a race. 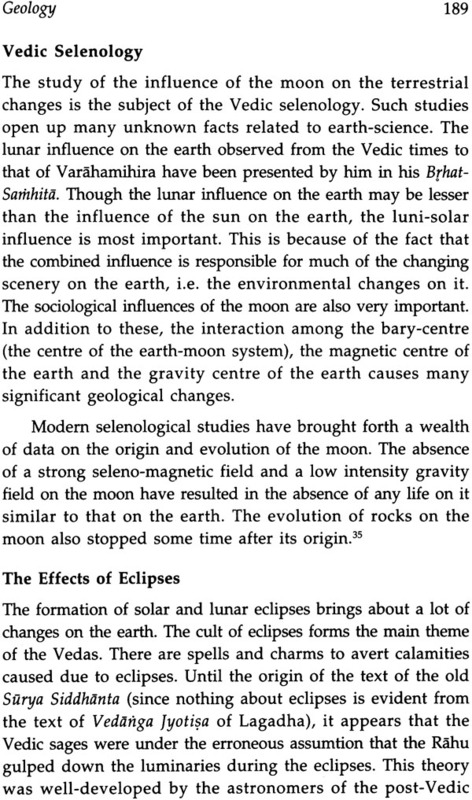 The hypotheses and the speculations of the Vedic seers go a long way in exploring the scientific causes and effects created every moment in nature. The Vedic deities symbolize the natural phenomena which the human beings come across in their day- to-day life. The present analysis contains the significant aspects of Vedic science and technology keeping coherence between the thoughts of the Vedic bards reflected in the hymns and the modern scientific theories developed later. It is, thus, revealed that the modern scientific theories and practices have their bases in the most ancient tradition and culture. 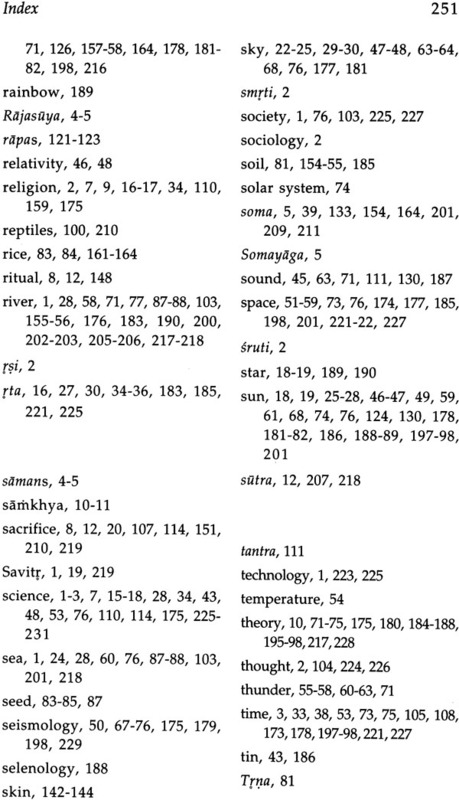 Various branches of knowledge, such as Astronomy, Astrology, Cosmology, Cosmogony, Space-time Continuum, Mathematics, Chemistry, Physics, Meteorology, Seismology, Botany, Zoology, Medicine, Agriculture, Geology, Environmental Science and Ecology, and Science and Technology have been discussed here in accordance with speculations of the Vedic bards reflected in the hymns. Many more scientific explanations of the Vedic words and terms can no doubt uncover the real ideas of the seers underneath the hymns. The present attempt is a very small beginning for a large building to be erected for explaining the Vedic verses in the true sense of the scientific knowledge. 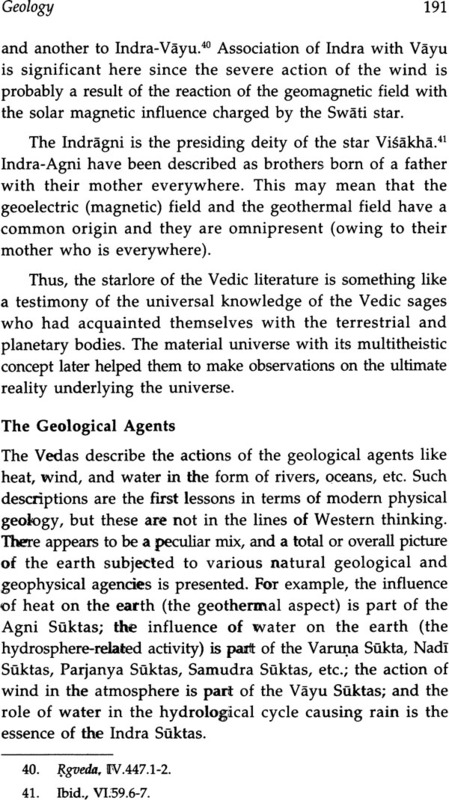 The Vedas are the primordial sources of human civilization and culture. Out of the four Vedas, namely g, Stma, Yajur and Atharva, the earliest specimen of Indian literature is the Rgveda, an anthology of hymns in ten books, I-X. Evidently, Vedic literature is the most ancient and marks the beginning Indian literature. It is also the first full-length religious and literary account of the Indo- European people. Being the earliest record of human civilization, the Vedas deal with various aspects of human life, the Vedic people came across or experienced. 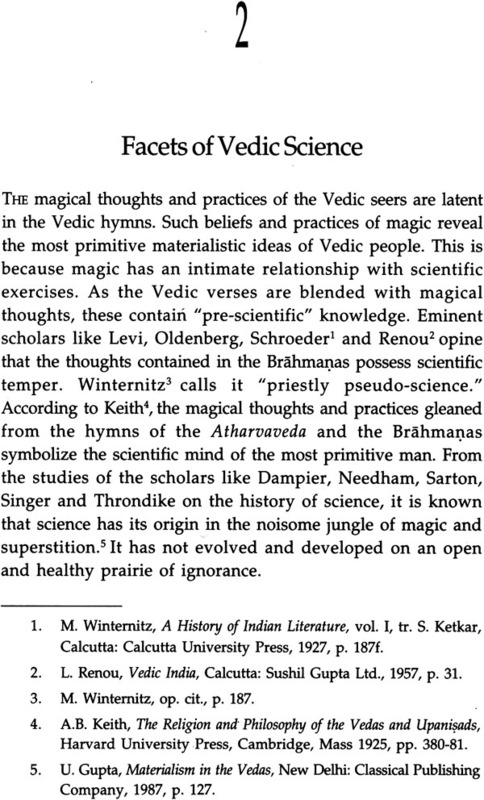 It is quite encouraging to record here that copious branches of Vedic studies are now opened up by our readers, interpreters and research scholars. Besides history, tradition, culture and literature, we find elaborate and lucid descriptions of the “creation.” Vedic Cosmology and Cosmogony describe the genesis of the universe, the earth, water, air and life. The ecology and the environment depicted in the Vedas include all the natural provisions made for human existence. 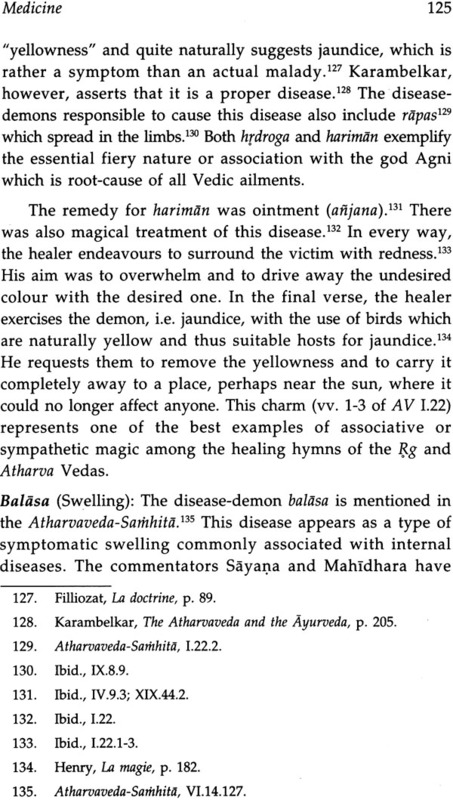 Vedic flora and fauna, rivers, lakes, seas, oceans, climate, mountains, forests, etc. provide the physical picture of the surroundings in which the Vedic people were living. The names of cities, towns and holy places have also been traced in the sacred hymns of the Vedas. Society, polity, education, science and technology in the realm of Ayurveda and warfare mark the significance of Vedic hymns. Above all, Matter (Pthvi), Energy (Agni) and Life (Savitr) are conceptually extolled in the Vedic suktas. Ostensibly, we have a comprehensive and coherent account of the Vedic people — their life, ethos, thoughts and beliefs. 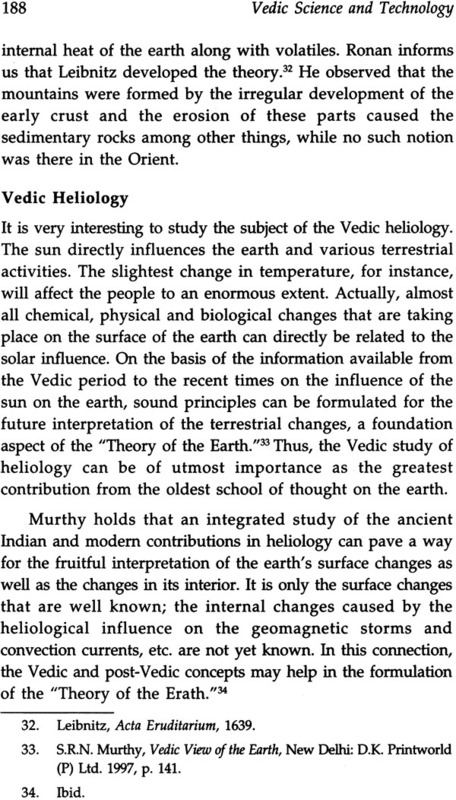 If the Vedas mark the very beginning of human knowledge and civilization adhering to all such branches of studies like history, archaeology, cultural anthropology, sociology, comparative religion and mythology, linguistics and philosophy, cosmology, ecology, environment, science of healing and the theory of the creation, then what the Veda really is? 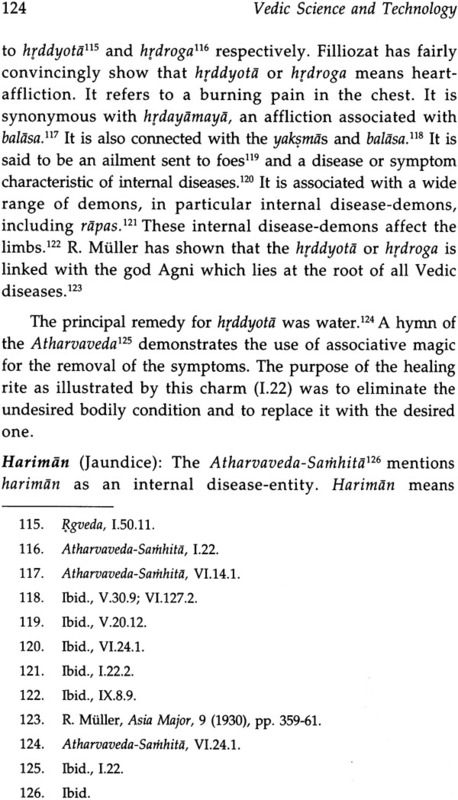 The Vedic texts, include the Samhitas or “collections” which generally present hymns, prayers and ritual formulae. 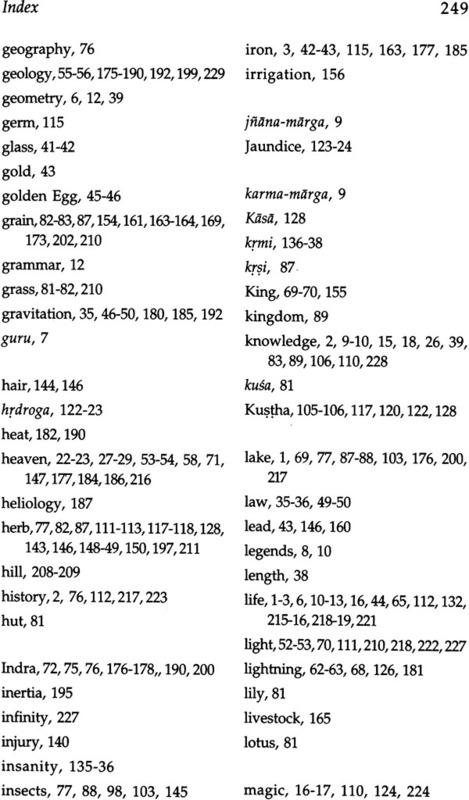 Other Vedic texts are the Brähmanas, the Aranyakas (forest texts), the Upaniads, the Vedangas (i.e. 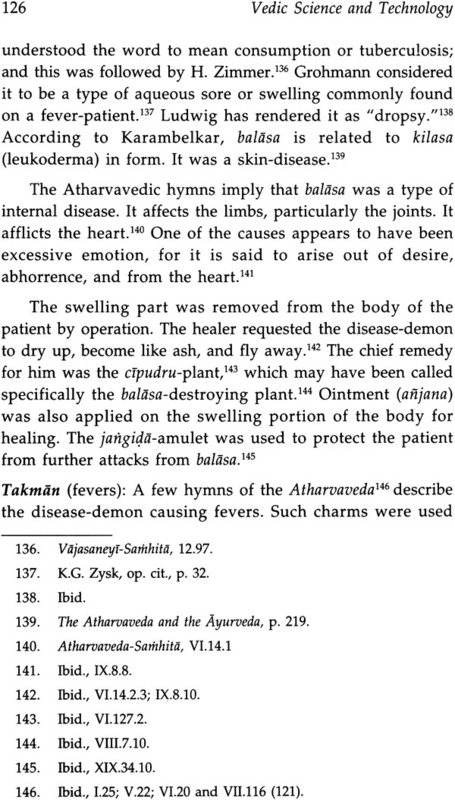 the auxilliary limbs of the Veda) and the Kalpa- Sutras. The subsidiary works of exegesis, explanation are not the part of the Veda in the narrow sense. In this, context, they are no longer sruti but smrti (memory). In fact, the most ancient form of Brahmanism is the Vedism established by the four Vedas and the Vedic texts.